What is "ISO" in general, and how is the scale defined? How does the ISO scale for film speed differ from ISO sensitivity as used in digital cameras? In photography, ISO generally refers to a measure of "Film Speed", which I use including reference to digital sensor sensitivity. In short, the actual letters ISO are a name for the International Organization for Standardization (not, officially, an acronym -- more information here), and in photography it refers to the ISO 12232:2006 standard and other related standards: ISO 12232:1998, ISO 5800:1987, ISO 6:1993 and ISO 2240:2003. (Links on the Film Speed page.) Film historically has also used the ASA and DIN standards, the former using the same numbering system, and DIN using an entirely different scale. The standards for film and digital are technically different (in ways I haven't investigated closely enough to report fully on), but generally they're similar enough that for practical purposes, they're essentially the same (notwithstanding Reciprocity Failure, which many films are quite prone to, though digital generally is not). So if you measure an exposure with your digital camera, you could use that exposure with a film of the same rating as the ISO setting you used in the digital camera, and expect to get a similar exposure (unless the shutter speed is long or short enough for Reciprocity Failure to kick in for the film) (also assuming similar equipment otherwise -- no differences in filters, etc.). In summary: higher ISO is more sensitive but noisier (but not necessarily worse), digital and film rated for the same ISO (or ASA for the film) will have similar sensitivity, and the scale is based on how quickly an image will become "saturated" given a certain amount of illumination. NOTE: I'm gearing up to do some experimentation related to the controversial answer from Matt Grum. Hopefully, my results will create a nice clear noise-free answer to the important point he brings up: that a high-ISO image with a low amount of light will be less noisy than a low-ISO image with the same amount of light getting to the sensor, which is later amplified in post-processing. More to come, hopefully in... EDIT: Well, I've failed to make this happen for a while now. I may still do it at some point. In the mean time, I'll also point to this article that talks about comparisons of native versus non-native ISO values, and amounts of noise in them, which, while the article doesn't exactly say so, I think is probably directly related to exactly this question. For a fixed amount of light coming into the camera, lowering the ISO will not result in a reduction of noise (improved signal-to-noise ratio). The only way to reduce noise is to combine lowering the ISO with letting in more light by opening the aperture or leaving the shutter open longer. If the amount of light you can let in is limited (you have hit the max aperture and can't use a longer shutter speed without introducing blur) then using the highest ISO possible (without clipping highlights) will lead to the lowest noise in the image. This is going to seem counter-intuitive and invite downvotes (seven so far! ), so please let me explain (see my response to comments at the end). High ISO values don't cause noise, lack of light causes noise. The reason people associate high ISOs with noise is because when you increase the ISO setting in shutter or aperture priority mode, the camera either closes the aperture or increases the shutter speed to compensate, both of which decrease the amount of light coming into the camera. Another source of noise is read noise. Read noise happens when the analogue charges on the sensor are digitised (read out). Read noise is approximately constant with respect to the number of photons captured. Increasing ISO amplifies the signal, and thus the photon noise, but the read noise stays the same. If you use a lower ISO (with the same amount of light coming into your camera) you will get an underexposed image and when you brighten it in post you will amplify both the photon noise and the read noise. Your total noise will then be higher. If you were to plot noise vs ISO for every pair of shutter-speed/aperture, you'd find noise always increases (sometimes only slightly) as ISO decreases. Therefore I don't see how you can argue that high ISO results in noisier images, given that when all else is equal lower ISOs give more noise! To minimise noise, get as much light as you possibly can down the lens (since noise is mainly causes by low light levels) using the aperture and shutter speed settings. And then whilst keeping these settings constant, increase ISO as far as you can (without clipping highlights) as this will reduce the proportion of the signal that is read noise. The method you use is of no real consequence, when you think about it using auto-mode and picking the ISO value that results in the shutter/aperture being as long/wide as you can get away with is equivalent to just setting the shutter/aperture to be as long/wide as possible in the first place and then setting the ISO to obtain the correct exposure. However, I wasn't suggesting a shooting methodology, the point I was making was, to minimise noise, you want to let in as much light as possible, given that you have achieved this with shutter/aperture/flash or whatever, the ISO should be as high as possible (before highlights clip), as anything else will result in underexposure and thus more read noise. if you actually do change your shutter speed and/or aperture (following the law of reciprocity, as one would normally do), then guess what: you get more photons on the sensor for the same "exposure" (call it EV as adjusted for the ISO in question)! So, less noise! Yes but you can't increase the ISO and at the same time change settings to let in less light and then conclude you have more noise because you're using a higher ISO. Especially when you can show that if you increase the ISO on it's own you decrease noise! It's like buying a car with a smaller engine in order to reduce fuel consumption, driving everywhere with your foot flat to the floor and concluding that small engines increase fuel consumption! Change one variable at a time. There seem to be a variety of opinions on this topic, and while they may seem mutually exclusive, I am not certain that is the case. There is no cut and dry "Yes, X ISO setting is always better." I think which is better is very dependent on context...on what it is you are trying to shoot, and what kind of light is available. Use the highest ISO possible to maximize saturation (and therefor minimize noise) without clipping highlights. Use the lowest ISO possible to minimize noise while using the correct shutter and aperture to achieve a proper exposure. The general consensus is that opting for the lowest ISO possible to achieve a proper exposure is the best approach. That statement is heavily laden with hidden meaning, however, as the lowest ISO possible may not necessarily be ISO 100. You may be forced to use a higher shutter speed or a narrower aperture to achieve the necessary creative effects you desire, forcing you to use a higher ISO to maintain proper exposure. You may also face issues with available light and reach the limits of your lens (i.e. maximum aperture) and be forced to use a higher ISO to achieve a correct exposure. I think that is the point Matt Grum has been trying to make. There is no requirement for a short shutter speed, so it could be as long as necessary to get a correct exposure. There is no requirement for depth of field, so the widest aperture will do. The available light is fixed, and can not be changed. A tripod and cable release will be used to eliminate any camera shake. The clearest shot is, as you can see, the ISO 100 shot. At maximum aperture, ISO 100 required a 0.6 second exposure time. This is pretty long, but since there was no motion, a lengthy exposure is not an issue. The ISO 1600 shot is still properly exposed, and used a shutter speed exactly four stops faster than the ISO 100 shot. Despite being properly exposed, there is obviously additional noise. The final shot was another ISO 100 shot at the same settings as the ISO 1600 shot, with the exposure value adjusted by +4EV in Lightroom. The noise level in this shot is obviously FAR higher than the other two since it has been digitally enhanced. Using the minimum ISO for scenes with no motion when shooting with a tripod will produce the lowest noise possible. Common for landscapes and still life scenes. Uncommon for sports, wildlife, bird, or any other action photography. Depends for things like portrait shots, however since you can usually control the amount of available light for portraits, a low ISO should usually be possible. Using the minimum ISO for a scene that allows you to expose correctly will minimize noise, but may not be the lowest possible noise. If you need to freeze action with a high shutter speed, or increase your DoF with a narrow aperture, you may need to increase ISO to maintain exposure. Shooting with the lowest ISO regardless of the situation is a bad idea. This will often result in under exposure (possibly severe) when available light is not optimal. This will result in considerably more noise when exposure is corrected in post processing. Use the lowest ISO you can while maintaining a proper exposure for the type of shot you are making. Its always better to actually get a shot than miss one because you don't like the camera settings necessary to capture it. Even if you have to use ISO 3200 to get decent indoor sports shots with your f/1.4 lens, at least you'll get the shots. Those ISO 3200 shots will have lower noise than the ISO 1600 shots that you underexpose then correct via post processing, as shown by the (rather extreme) example above. De-noising algorithms are also pretty advanced these days, and can greatly reduce the noise level of a high ISO shot to more acceptable levels. That again makes using a higher ISO that will ensure a correct exposure a better option than a lower ISO that will likely underexpose and require post-process correction. Further investigations to cover Matt's assertions about ISO have lead to another sample image. The image below is split into four bands, two representing exposure following Matt's methodology, and two representing exposure where ISO is kept as low as possible. The assertion was that when trying to expose a scene, you set aperture and shutter then use the highest ISO possible without blowing out highlights, and correct exposure via post processing by reducing EV, to produce an image with the lowest noise. This contradicts the normal assertion that one should use the lowest ISO and adjust aperture and/or shutter to achieve a correct exposure to maintain the lowest noise possible. The first and third bands in the image above were shot by choosing a specific shutter speed and aperture, then upping the ISO as far as possible without clipping highlights. The second and fourth bands in the image above were shot by choosing ISO 100 and a specific aperture, and adjusting shutter speed to achieve a correct exposure (no ETTR.) Both images were corrected in post production by using Lightroom's "Auto Tone" feature, which caused a reduction in the high ISO image's exposure by a little bit, and pretty much left the ISO 100 image the same. There is a difference of three stops ISO between these two shots, and the increased noise level of the ISO 800 image is very clear in the shades. In the midtones, there is some observed increase in noise in the ISO 800 image over the ISO 100 image. In all tonal levels, fine detail has been lost to one degree or another in the ISO 800 image vs. the ISO 100 image. This can be observed by examining the remote control in its cradle, the fronts of the palm, and in any shadow tones. In the mid tones and highlights, noise levels are not specifically high enough to cause any significant degradation in print. The noise level in midtones and shadows is, however, likely to intrude onto fine details, such as one might pick up with macro photography or any photos that push the limits of resolution of a lens or sensor. While negative exposure compensation in post processing has indeed reduced the noise level of the high ISO image to more acceptable levels, there is no question that using the lowest ISO possible will result in lower noise than even post-process negative exposure compensation of a high ISO image. The real question is, is it always appropriate to use the lowest ISO possible? If you can expose the scene you are trying to capture without any undesirable side effects, such as blurring, underexposure, etc. then choose the lowest real ISO you can (expanded ISO settings usually achieve a lower ISO setting through digital, rather than analog, means...so using ISO 50 Expansion for example, should be avoided.) If you can not expose the scene you are trying to capture without any undesirable side effects, which might be the case when photographing sports or wildlife, photographing concerts, or doing much of any kind of indoor photography involving any action, then increasing the ISO to the minimum acceptable level that will allow you to expose your scene properly (i.e. eliminate motion blur, expose at the right level, etc.) should be chosen. ISO is effectively a sensitivity of the sensor, whether it be film or digital. In theory, ISO for a digital camera should be the same as for a film camera. The ISO on film is determined by the grain size of the chemical. What this will mean is that the resolution will be better with a lower ISO film. Also, because a film grain is all or nothing, this will lead to some spottiness, or noise. The way that ISO is achieved in a digital camera can help to understand why it is important, and why using a higher ISO isn't always a good thing. I don't know the way it was achieved in film, so I can't really speak to it, but I imagine it's using somewhat similar principals. First of all, Matt did an excellent job explaining the different sources of noise. What happens in a camera actually comes down to the following. The signal on the sensor is passed through a gain circuit. The amount of gain depends on the ISO setting being used. The signal value is then ran through an A2D converter. What this will do is map the amplified signal into a range from 0 to 255 (Or higher, depending on the number of bits in the converter), a digital signal. The camera then may remove some of the basic sources of noise, especially the "Dark current" noise. That's the signal if you were to expose complete blackness. So what actually happens when you turn up the ISO? There's basically two paths, which I'll cover below. If the ISO is increased, and the shutter speed correspondingly decreased, then the signal level going into the A2D converter remains the same. However, the amount of signal on the sensor is decreased. That means that any noise which is sensor depended will in effect be amplified. This includes things such as Shot Noise. Some other forms of noise won't be amplified. The second option is if the original image was underexposed, but the ISO brings it to being correctly exposed. 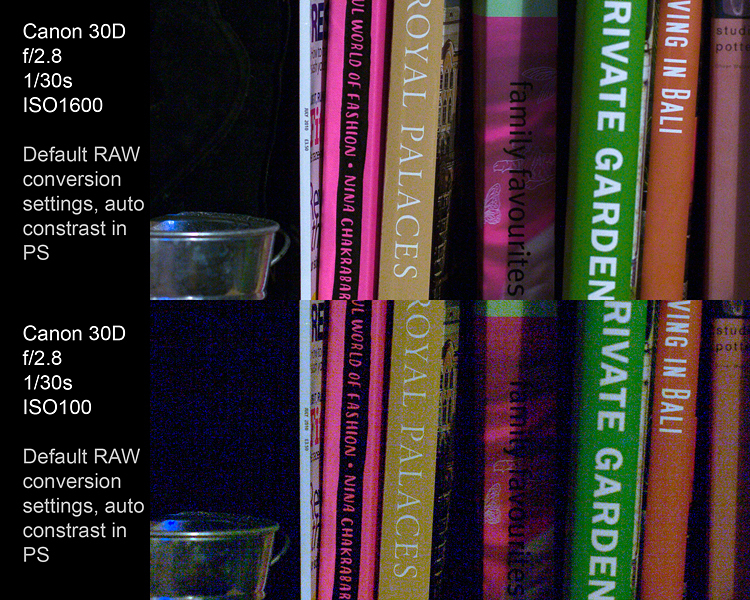 It is possible to contrast enhance the underexposed image to have the same max/min as the correctly exposed image. The signal coming out of the A2D converter will effectively have a smaller range. This will leave only a few light levels, leading to a much noisier looking image than the correctly exposed image. A few other interesting things. Sensors tend to bleed if they are saturated to neighboring pixels. If an image is increased in ISO and decreased in shutter speed, then it will not be saturated on the FPA itself, removing some artifacts. This can lead to somewhat better performance when saturated. In general, high ISO on a digital camera will have less noise then the same ISO on film, due to a much better way to achieve high ISO. Hopefully this wasn't too technical, but I'm just excited to share my knowledge of Electrical Engineering with the community:-) Let me know if you have any more questions, and I'll try and explain it even better. To answer the second question, I'd say that lower ISO isn't always better, but in general, it's best to use the lowest ISO you can. If you are shooting indoors, for example, a higher ISO will allow you to use a shorter exposure time, leading to less motion blur. Usually I use the lowest ISO that will allow me to not be over the hand-limit of 1/lens_length shutter speed. But there are always exceptions. In digital photography, ISO speed rating does not characterize sensor sensitivity. ISO speed setting on a digital camera is controlling the amount of amplification / multiplication of the signal from the sensor after the data is already captured. ISO speed does not control the sensitivity of the sensor, and is more like a "push" processing of a film, thus controlling overall brightness of the outcome. Because of the limitations of the analogue-to-digital converters in some cameras, higher ISO may result in less noise, and less plugged shadows. In analog photography, ISO measures the sensitivity of the film to the light. A film with higher speed will reach its saturation (or overexposure) point faster. You can use a low-ISO film in bright light. In dimmer situations, it may require a wider aperture than you have available or a very long shutter speed. You can use a high-ISO film when there is not enough light for proper exposure. However, if you use it with lots of light, you will have to restrict the light coming to your camera with shutter speed and aperture. It is just an arbitrary1 number that describes the amount of amplification applied to the analog2 signal from the sensor before converting it into a digital number. It represents how many photons are required to produce a value of "one" on the resulting digital pixel. It does not describe the sensitivity of the sensor. Increasing the ISO will not let you see more light in dark conditions and it will not saturate the sensor any faster. It will just stretch the signal so less light is required to produce the same pixel value, also amplifying the noise. So the image will saturate faster, but you will not be using the full potential of the sensor. Then where does the common misconception that more ISO equals more noise come from? Because people, being used to analog, would pick an ISO number and stick with it, and then set the exposure to prevent overexposing the resulting image. This is upside-down because you are restricting the amount of usable light entering the sensor to satisfy an arbitrarily chosen constraint. Instead, pick the best aperture and shutter speed for your conditions. This will minimize shot noise. Then raise ISO as much as possible without overexposing, to reduce the amount of read noise. Or just let the camera choose ISO for you automatically. 1 They do set the numbers to make the image look like an image taken with a film of that ISO speed under similar conditions. Unfortunately, they don't take into account sensor size which adds even more confusion to the common myth that larger sensors are better in low-light conditions. 2 Some cameras cheat by also amplifying the digital signal, after A/D conversion. This doesn't help with the myth that higher ISO produces more noise, when the opposite is true in reality. 3 The additional noise is called read noise, which is introduced by the A/D converter after applying ISO. Not the answer you're looking for? Browse other questions tagged iso digital-vs-film noise iso-noise or ask your own question. Is high ISO useful for photography? What is meant by the “native ISO” when talking about DSLRs? Why can't the ISO level on most digital cameras be set below 80? Can someone give a simple explanation of ISO? 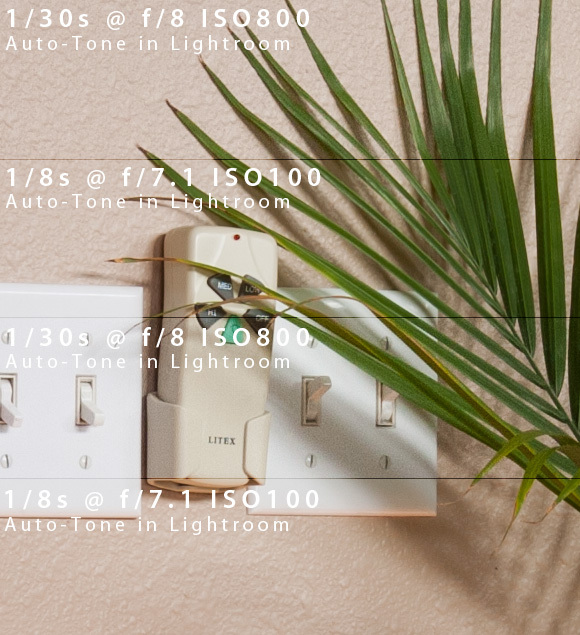 What makes a good sample image for ISO comparison? Why is the lowest ISO always 100?